All diamonds set into our jewellery are hearts and arrows cut. This is the highest cut available to ensure intense fire and brilliance from all of our jewellery. The Hearts and Arrows diamond gives the impression of arrows when viewed from the top, and hearts when viewed from below. When a diamond has a high quality cut (Very good / Excellent), the light will enter through the top, where it reflects from one side to the other before bouncing back out of the diamond's table toward the observer\'s eye in an even dispersion. 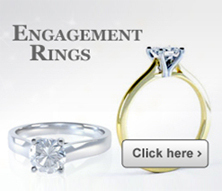 This phenomenon is referred to as "light return" which affects a diamond\'s brightness, brilliance, and dispersion. Not only do Hearts and Arrows diamonds appear more brilliant, they can also appear larger than other stones of the same carat weight. An ideal stone has both increased brilliance as well as increased diameter relative to more deeply cut diamonds. Learn about the attributes of diamonds by clicking any of the Diamond Education categories on this page. Learn the 4 C's of diamonds: Cut, Color, Clarity and Carat Weight. Click the Certificate link to learn all about the G.I.A - Gemological Institute America or IGI - International Gemological Institute. A diamond's cut is not only about its shape, but how effectively the stone can return light back to the viewer's eye. A well-cut diamond will appear very brilliant and fiery; while more poorly cut stones can appear dark and lifeless, regardless of color or clarity. A certificate is a blue print of a loose diamond. Wholesalers, retailers, and consumers alike know a certificate as either a diamond grading report or diamond dossier. A certificate will tell a diamond's exact measurements, weight, cut and overall quality. When shopping for a diamond, it is generally preferred to have the least amount of color possible. Diamond colour is divided into five broad categories. Nothing shines like yellow gold, white gold, or platinum. Over time, precious metals have come to symbolize wealth, power, and strength. Their beauty and physical qualities make precious metals a prized part of any jewelry collection.